Framed, a Norman Rockwell painting, appeared on the cover of The Saturday Evening Post published March 2, 1946. This is another favorite of Rockwell collectors, a classic enduring image of the world Rockwell painted. Alternate titles for this painting are Man Carrying Frame, Picture Hanger and Museum Worker. This painting was Rockwell's 237th overall out of 322 total paintings that were published on the cover of the Saturday Evening Post. Rockwell's career with the Post spanned 47 years, from his first cover illustration, Boy With Baby Carriage in 1916 to his last, Portrait of John F. Kennedy, in 1963. This was also the first cover for The Post in 1946. In 1946, there were seven Norman Rockwell Saturday Evening Post covers published. The original oil on canvas painting is part of the collection of the Taubman Museum of Art. on page 165 of Norman Rockwell, A Definitive Catalogue by Laurie Norton Moffatt. Two studies also appear in the Norman Rockwell Catalogue on page 166. In this painting, Norman Rockwell uses two familiar storytelling devices that we have seen him employ with great success in other paintings. One such device is the picture within a picture device. Here wee see the museum worker becoming a painting just by carrying the picture frame and framing his his face and shoulders in profile. The other device that Rockwell fans are delightfully familiar with is the use of expressions in the paintings in the background. All of the other three framed paintings seem to be following the framed worker. They seem to be watching his walk by them, just as if they were alive. 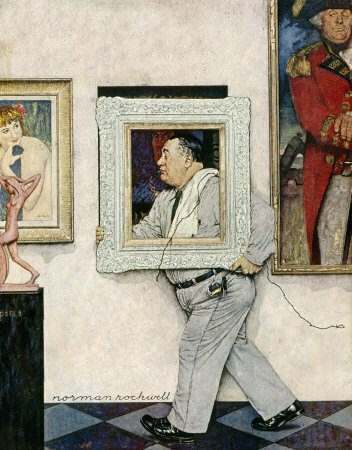 Framed was only one of 322 Norman Rockwell Saturday Evening Post covers; Here is the list of Norman Rockwell Saturday Evening Post cover illustrations. All three paintings seem to be reacting with personality. One seems amused, one somewhat hostile and the third, the female in the left painting, intrigued. One has to wonder if the paintings would have reacted in this manner if the worker had not been so absorbed in his work. His singlemindedness to his job may have saved him from a nervous breakdown. Do You Have A Great Story, Opinion Or Contribution About Framed?